Whom Pods Destroy is back for another episode of top Star Trek chat. In this edition we’ve gone all Gorn and discuss the first season original series episode, Arena. 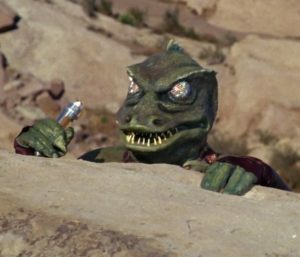 There are few images more memorable in Star Trek lore than that of the green skinned lizard creature that is pitted against Captain Kirk in a trial by combat orchestrated by the super advanced Metrons. On the surface this episode of more than just Kirk fighting a bloke in a lizard costume. Graham, Derek and Terry pore over the show’s themes and messages and ask if there is anything to learn from Arena or is just a whole bunch of lizard fun.